I absolutely love posting deals and helping save our readers money, especially if the devices in question are brand spanking new. Therefore, today's late-Friday price drop on the Verizon Motorola Droid 3 that literally came out within the last few days, gives me double the pleasure. Motorola's first dual-core phone in the Droid series, the Droid 3 sells for $199.99 directly from Verizon but was being offered at a discounted online price of $149.99 at Wirefly and Amazon Wireless as of yesterday. Today, Amazon Wireless decided to throw down the gloves and pushed down the Droid 3 price for new accounts to only $69.99. Let me be perfectly clear - that's a hell of a deal on a brand new slider with a 4" qHD screen and 2 cores that are faster than Tegra 2 (TI OMAP 4430). Sure, it may not have 4G LTE, but it does have 1080p video capture and Android 2.3 to make up for it. Oh, and don't forget the bonus Amazon is currently throwing in - $15 to spend on apps, MP3s, and Kindle content. Every dollar counts, right? If you've been saving up and eyeing the Droid 3, waiting for a price drop, this deal is for you. I'm not sure how long it'll last, but don't test your luck and grab it before it disappears - in my experience, Amazon doesn't keep prices this low on new devices for too long. 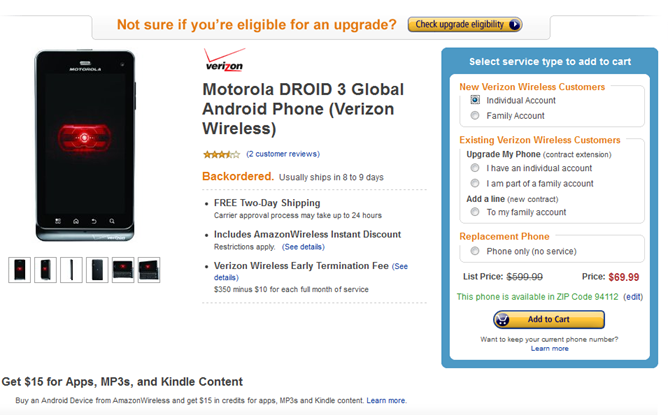 [Source: Droid 3 at Amazon Wireless] Thanks @RigWig!